I enjoy woodworking as a hobby. I dabbled in Junior high and had the bug all my life. But with life, kids and responsibilites that kept me from really doing anything. Now that life has calmed down some I got started playing with woodworking again. I want someday to get into larger projects after maybe getting a Shop built, since I am currently working from my garage, and could use more room to work on larger projects that take more time. So right now I am just learning and playing with smaller projects. I kind of got off into Dominos and have had so much fun doing them and trying to hone the process. I enjoy making things that people are proud to have so the thought of making an heirloom is what keeps me challenged to produce the best that I can. How long does it take to get an approval on a post? I made my first project post earlier and I still do not see it. 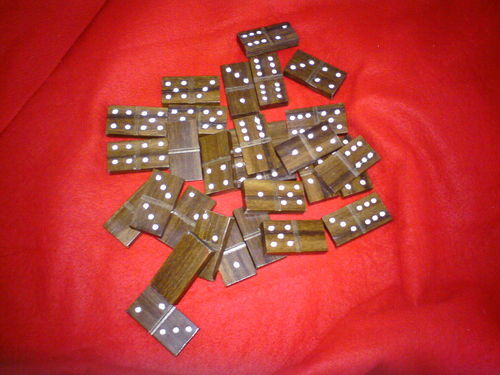 It was a set of Mesquite Dominos. Welcome :) instantly after your first post. I made a drilling jig from perspex. I would be interested to find out how you did yours. They certainly look a lot neater. I use a drill jig I made on mine as well. I made it a couple of years ago. I use a 1/4 inch ball end mil in a drill press to do them. your work on these is stunning. I love the use of the different woods…...especially taken with the mesquit. BTW, I was up in your fair city “Cowtown” all of last week for our national horse show. Welcome to the forum and keep those great project pictures coming. Rick, you’ve got amazing talent. Don’t cut yourself (or your wood) short. :) Work/Play safe. Keep makin dust. Welcome to LJ’s. Anyways, your sets really are fantastic and it doesn’t seem many people make them, much less talk about them on forums. Rick- sorry it’s taken me so long to respond to your request of information regarding the E-Pipe components. I do not have any photos but it’s pretty easy to explain. In the bowl area is where the battery will go. Make sure you leave room for wiring and button switch, about 1/4”. The shank is where your 510 connector will go, again make sure you have plenty of room for wires. You can decide from the 510 connector what you’re going to put on it, cartomiser, tank or in my case I put a Force Kick for variable wattage. All of these will screw onto the 510. Soldering to the 510 is tricky. There are plenty of YouTube videos out there to help in the whole process. I also make a tank cover or forward shank. Make sure your holes are lined up for the stem or mouth piece. That’s about it. I use only real tobacco pipe designs because they appeal to me but you can make anything. I have a new customer wanting a similar pipe as the Packer Pipe which I will finish in a few weeks. Good luck on yours!